In December 2015, Gwen Gutwein made her final trek–searching out distinctive and historic Indiana barns. Exhibits of Gwen Gutwein’s barn paintings and histories have been touring the state of Indiana since 2009, but her barn-painting project trademarked HERITAGE BARNS started more than eleven years ago in the fall of 2004. And it all began with a lofty and time-consuming goal: to research, study, and paint two historic barns from each of Indiana’s 92 counties. When asked about the project’s purpose and her own motivations, answers come easily. “Over the years I have seen so many barns disappear. With each barn we have lost so much. The old barns are very beautiful, literally and figuratively speaking. Literally, 100 or 150 years ago the materials used to build a barn are almost non-existent today. The size and length of some of the timbers is extraordinary. Many old barns were built with our native timber! The skills used back then are unique, ingenious and quite astounding. The time and skill used to decorate barns must have given such great satisfaction to the barn owner. Over the years, their barns have graced our countryside with their unique beauty. And then there is the beauty expressed through time that becomes an integral part of the structure itself, such as the family history, the cultural history, the farmers’ integrity and the farming ingenuity. To say that this project was a labor of love undercuts just how much work it included. “Gutwein has a distinct process for completing this extensive project. She begins with detailed research on each county, through which she selects specific historical barns. After making contact with each barn owner, she obtains consent to begin the painting process at their location. 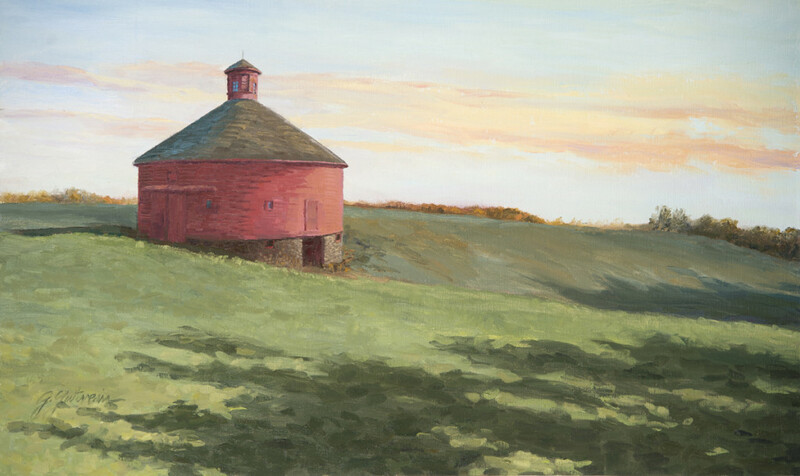 Gutwein paints en plein air (or outdoors) for several days to capture the correct lighting, color, mood, and character of each barn. Measurements, statistics, and stories are also gathered while on site. From there, Gutwein utilizes photography to record every detail of the barn, from which she can paint in her studio. Until Gutwein feels the project is complete, none of the barn paintings will be for sale. She finds the whole project is greater than its parts” (Fort Wayne Museum of Art). 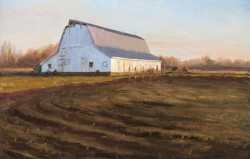 Her HERITAGE BARNS series of paintings, all 185 (one extra) have been endorsed by the Indiana Bicentennial Commission. Beyond exhibits, Gwen has promoted barns and preservation through interviews, newspaper articles, “barn talks” and more. Currently, the Columbus Indiana Visitors Center is hosting an exhibit, installed through the end of 2016. To learn more about the HERITAGE BARNS project, see the barns she has painted from each of Indiana’s 92 counties, and discover some of the barn stories she has collected, just visit Gwen’s website and watch the video below to check out her studio!